By now you may be able to tell that I’m pretty detail oriented. I wanted my wedding to be as personalized as possible and how else to set the mood of our big day than custom designed invitations (by me, of course) and then hand letterpressed to perfection. 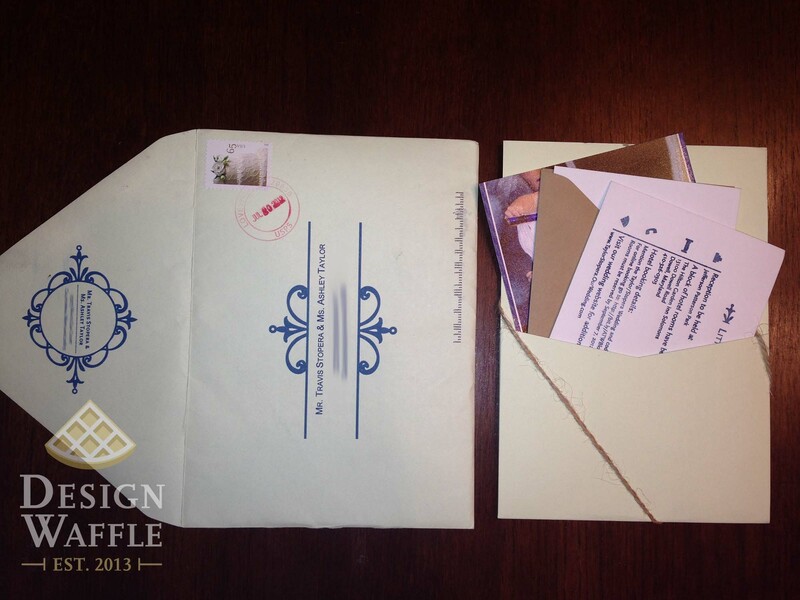 Invitations are your guests very first impression of what your wedding will be like and I wanted them to know it would be personal, and most of all… far from ordinary. 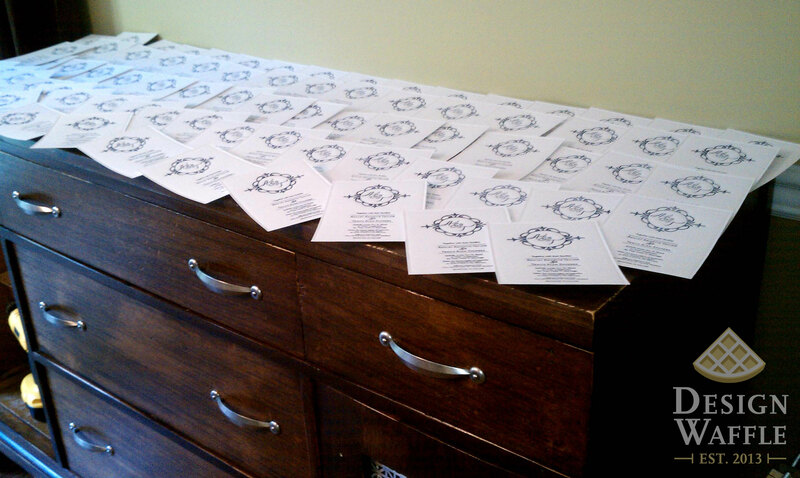 It took 3-4 hours to press the invitations, rsvp cards and little details cards and about $300 in supplies. Not bad! 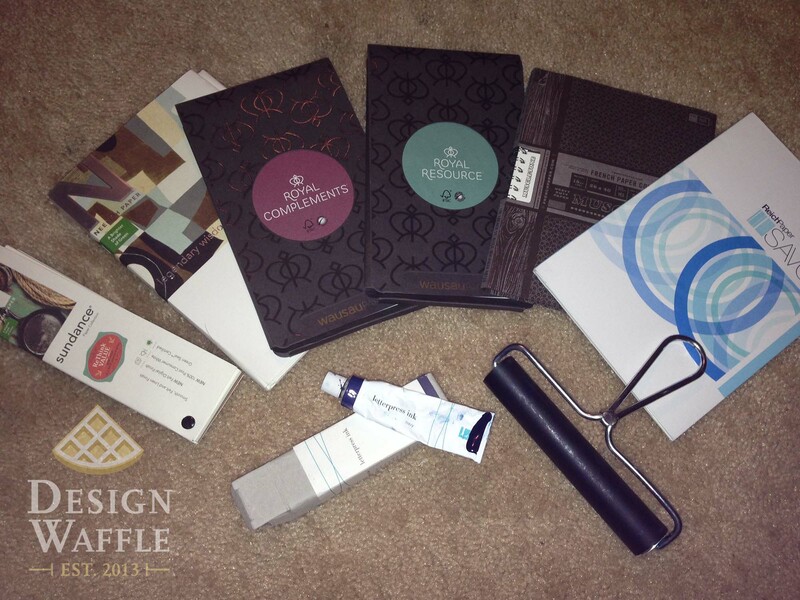 ….Wondering where the “waffling” comes in to play with this project? 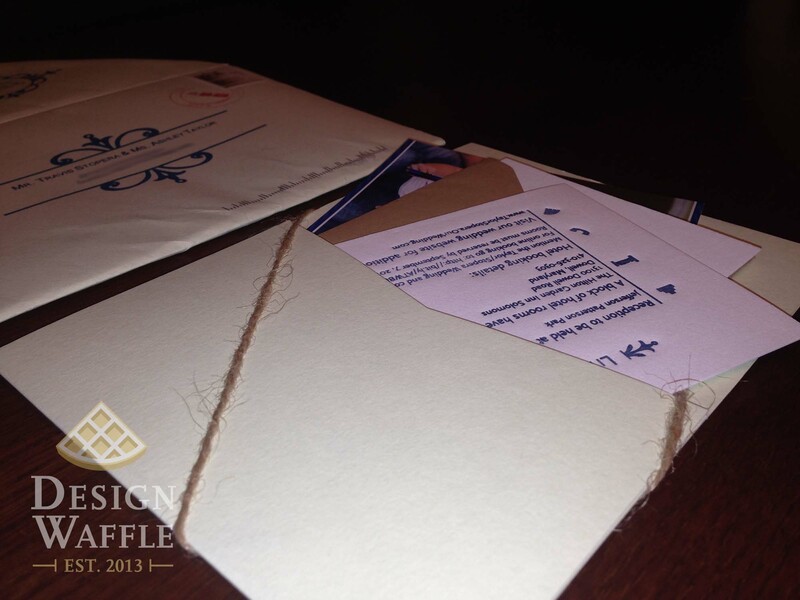 It took a whopping 6 months to decide on a design for our invitation suite. Should I go over the top and elaborate, or stay classy and simple? I tried out both and ended up with a clean and simple design, letting the letterpress add the extra special touch. FYI, this is a super photo heavy post! And I only included a fraction of the photos we have. Let’s start with the press itself. 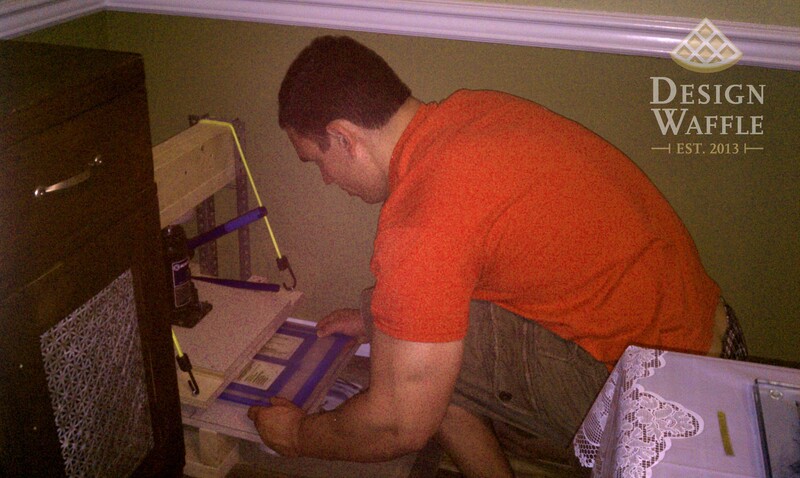 Travis and I built our letterpress. We used the method shown here. Although it’s not quite the same as a traditional press, ours has over 6 tons of pressure! Needless to say, it’ll get the job done. …I’m briefly skipping to the final product because I just can’t hold off until the end! 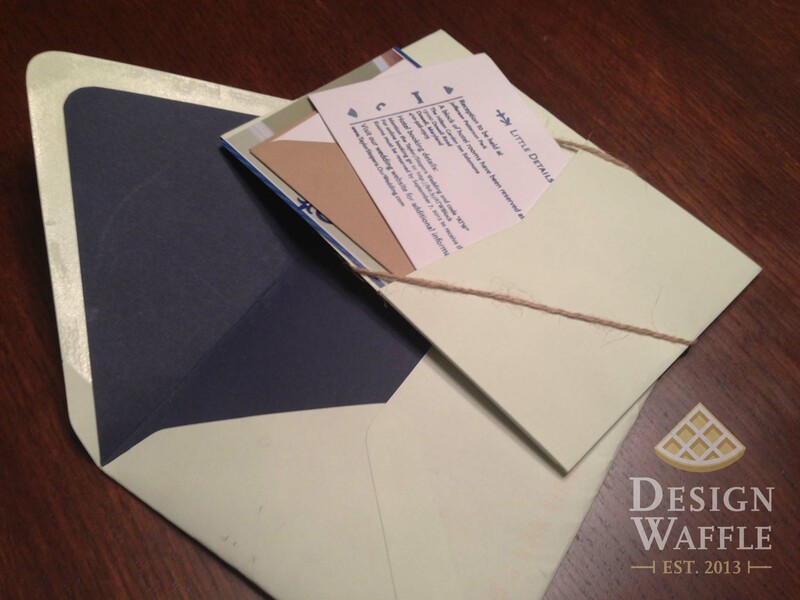 Here is what we mailed to all of our guests. Since our save-the-dates didn’t have a photo like many couples will send, we wanted to include a photo of us with our letterpressing beast. It was important to us that our guests knew that we didn’t just go to Staples or hit the order button. 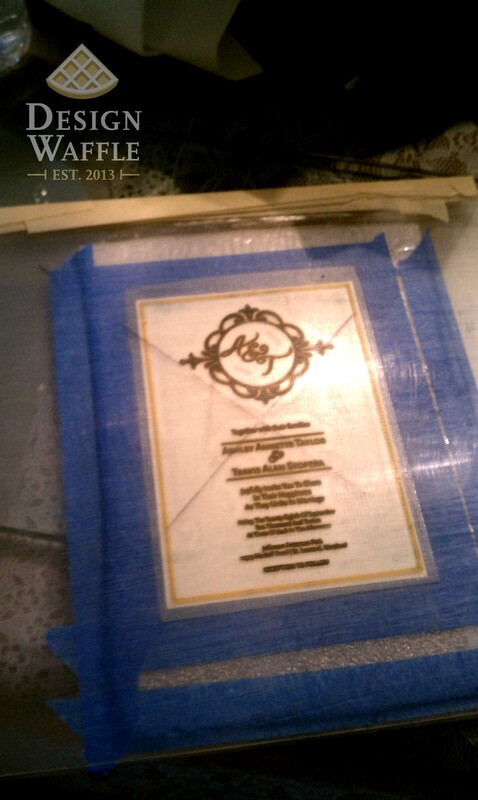 We built our press, designed the invitations, and hand printed every single invitation. How special is that?! 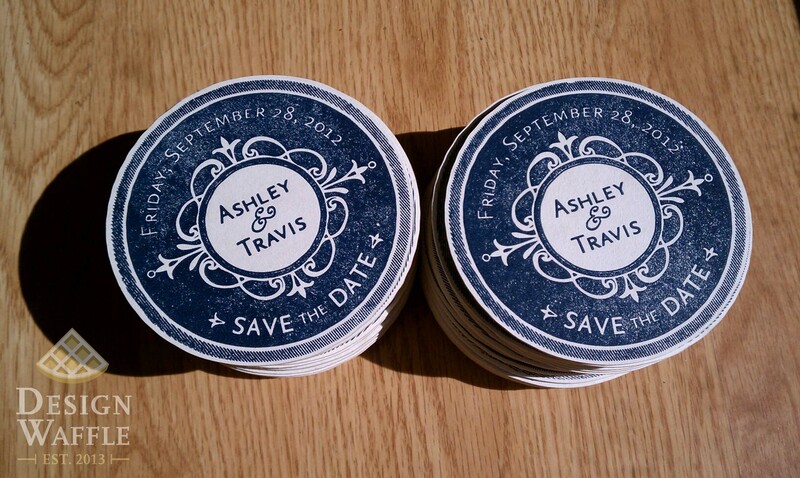 FYI, here’s how our save-the-date coasters turned out a few months earlier. I put a magnet on the back and mailed these babies out to all our family and close friends. 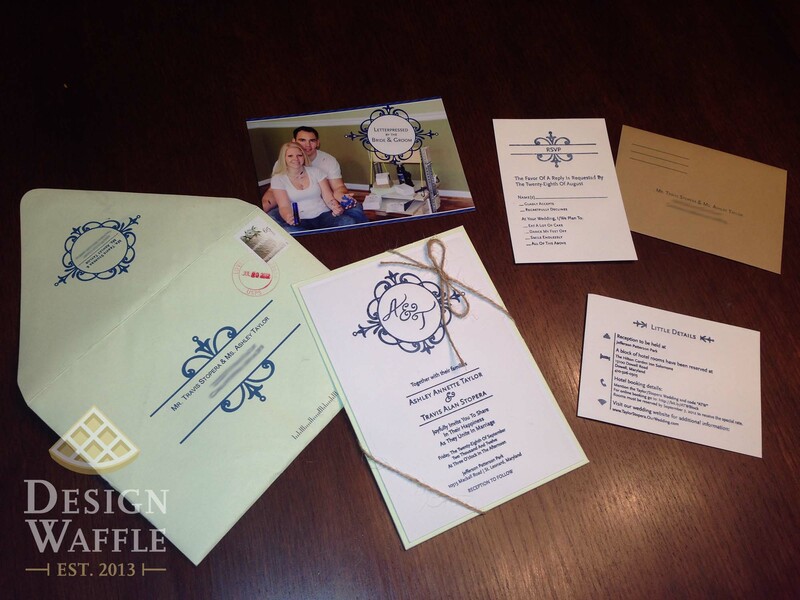 We did numerous test prints with our save-the-date design to find the perfect paper for our invitations. I had a TON of paper sample booklets so I tore out the samples I thought would work best and gave them a shot. I wrote the brand and type of paper on the back of each piece so they didn’t get all mixed up. We ended up choosing Savoy (in the bottom right corner). When letterpressing, regular paper just won’t do. You want 100% cotton paper. 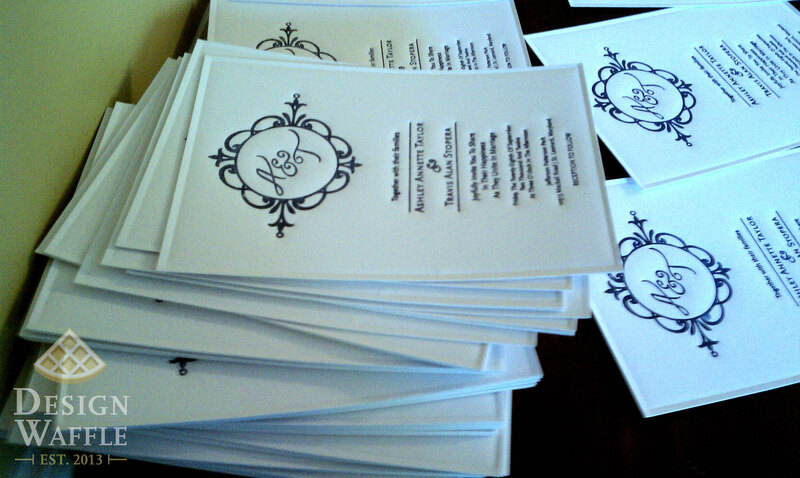 We ordered ours from cutcardstock.com because they’ll actually custom cut your paper to any size. This was a HUGE time saving move for us. Our RSVP and “Little Details” cards were a standard size, but I designed our invitation card to be a little smaller than the pocket panel so that it would have a nice pop of color on all sides. 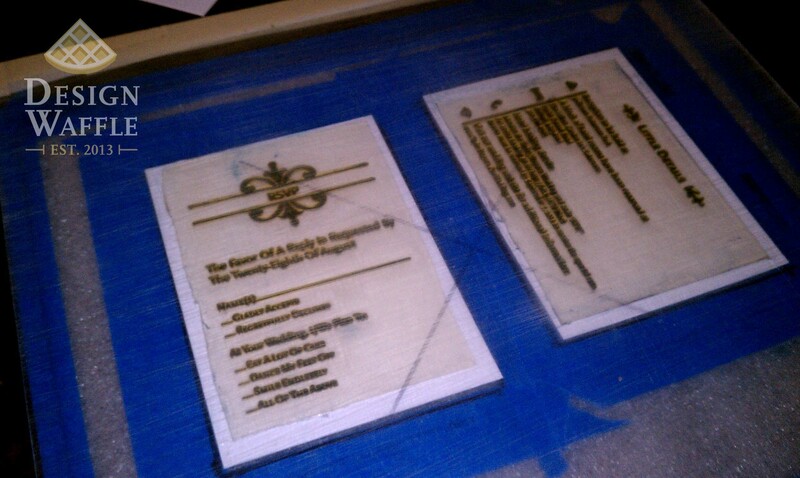 Just so you know, letterpressing coasters is much more difficult than paper. The guys from Elum Designs said they’ve had trouble mastering it and definitely try to steer people away from it. The material is so hard and compact that the plates have a hard time pressing into them. Our save-the-dates were more so printed rather than printed with an impression. I still loved the outcome so I was ok with that. 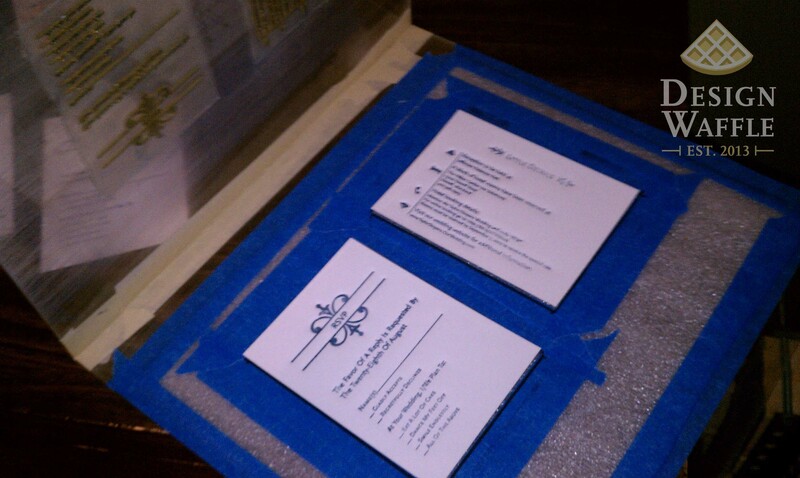 Our letterpress plates were made by Elum Designs. This company is seriously AMAZING. No kidding. Considering this was my very first time letterpressing on paper (we letterpressed save-the-date coasters a few months earlier) I had a ton of questions and trial and error issues. Their team was awesome at emailing and calling me back immediately. They sincerely care about each and every customer… even if you’re only ordering plates versus having them letterpress your job. I made this handy little hinged plate holder with plexiglass and tape (very advanced, I know). It held everything together nicely without the paper slipping and smudging the print. In order to get the deep impression in the paper, you need to place “packing” paper underneath. 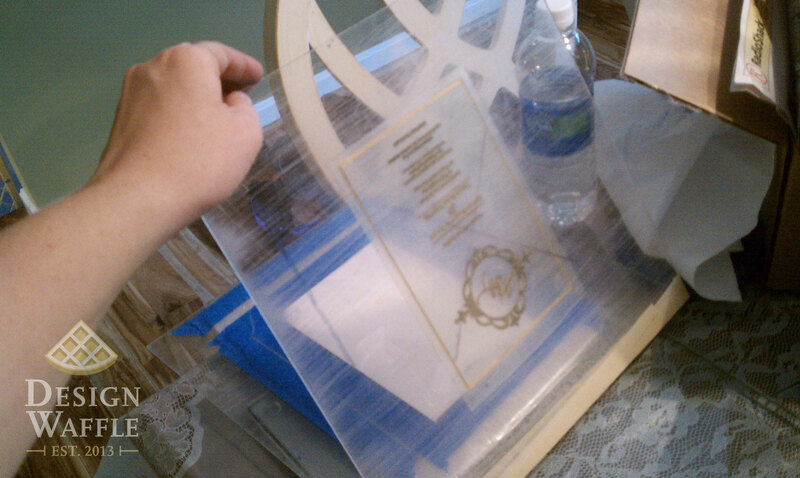 Several sheets of soft paper will provide just enough give for the plate to sink into the printed paper. We actually didn’t use packing paper. 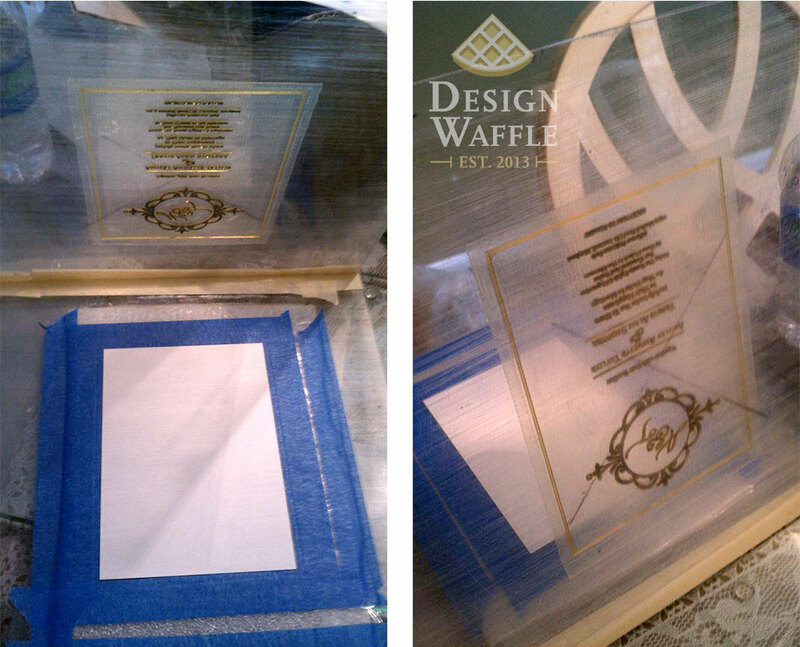 Instead, we used a super thin piece of flexible foam that came out of an oversized cushioned mailing envelope. I realize it’s not traditional to use foam as “packing” underneath the paper you’re going to be printing, but it actually worked like a charm and we didn’t need to replace it during the process because it puffed back up after each print. I used painter’s tape to frame out where to place my paper each time before printing. We don’t have video footage of us using our press, but here is a helpful video that sort of sums up how we did it. You’re probably wondering why there’s a slab of granite inside of our press, right? Unlike a traditional metal press, our press bed is made of wood, which absorbs the pressure making the print come out less defined. My family owns a kitchen company so granite was the first hard surface that came to mind. It did the trick! We bought craft store letterpress ink from Amazon. It was about $7 for the tube and it was enough to do the entire invitation suite, plus the save-the-dates and I still have a lot leftover. It really stretches! The brayer also came from Amazon. 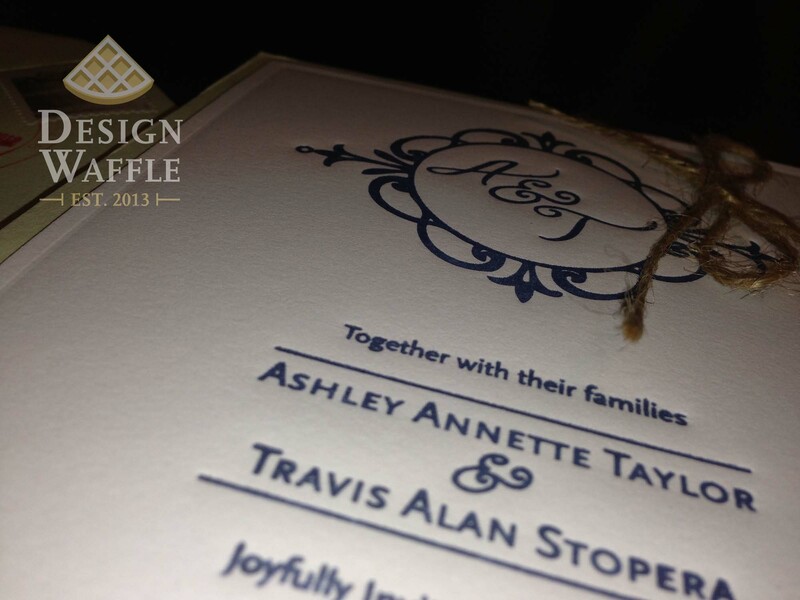 If you look at our finished invitation print, there’s an inkless impression making a border around the inked design. 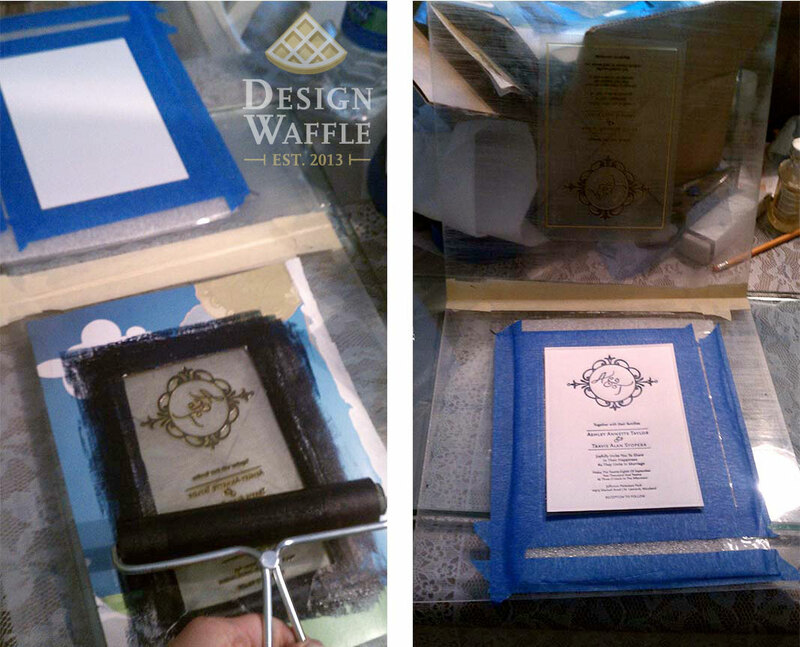 The photos above and below show how I masked off the letterpress plate with a sheet of paper with a window cut-out. This kept the edges of the plate nice and clean, exposing only the design during printing. Place the plexi boards inside the letterpress and crank the handle until it becomes tough to move. This will take some trial and error to find the right amount of pressure. Your letterpress is actually strong enough to break itself so be careful not to over do it! The letterpress will start creaking, that’s about the right time to stop, release the pressure and pull out the plexi boards. 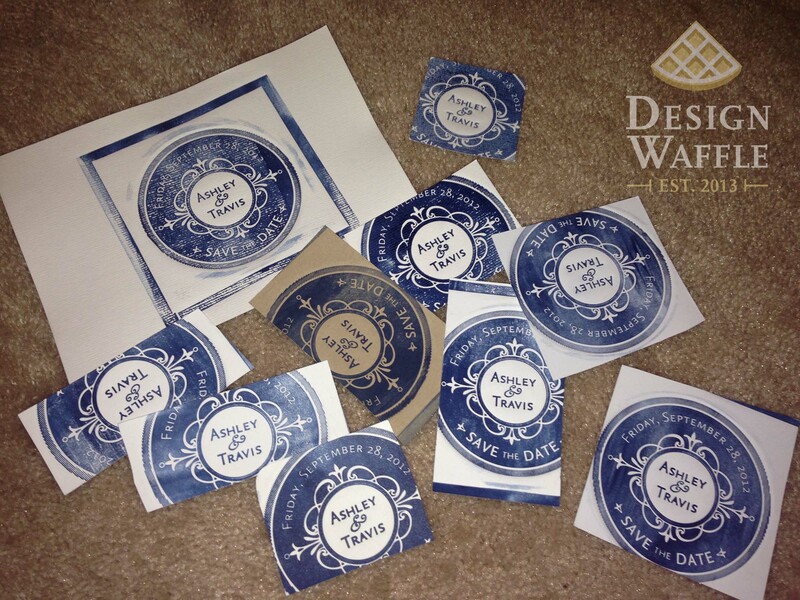 You will need to reink the plates for every invitation to ensure a nice inked print. 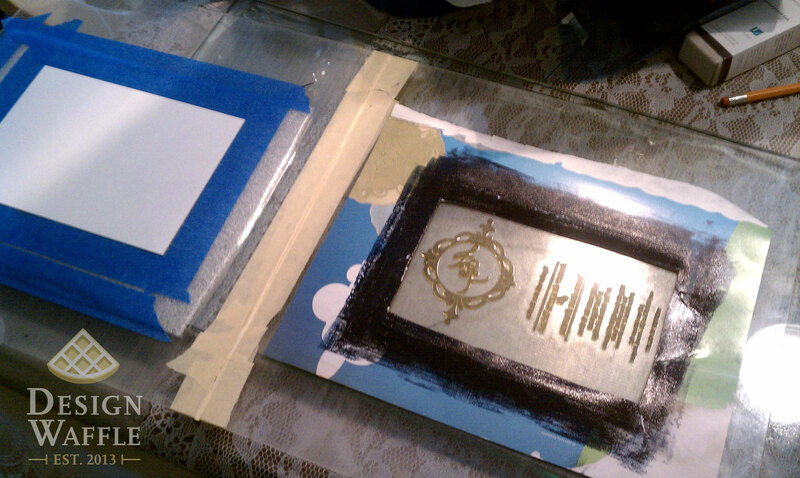 As you use up the ink, you will need to reapply ink to the glass and respread it with the brayer. 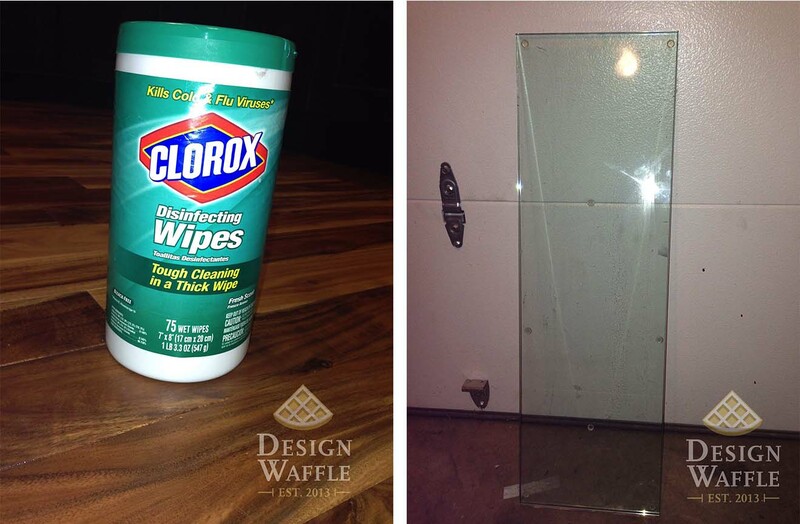 Occasionally, you may need to clean the glass and letterpress plates with the Clorox wipes as the ink may get caked and become stiff. 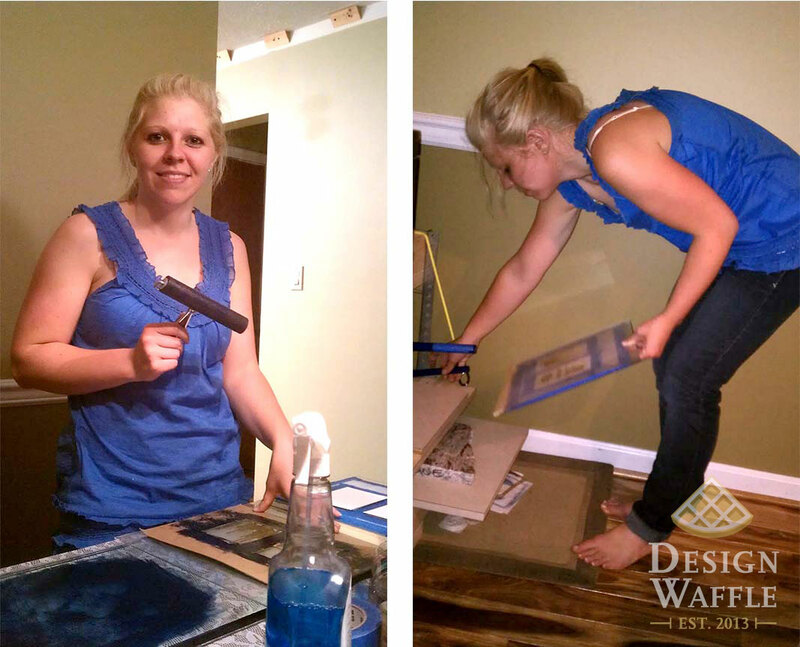 Make sure you clean up entirely after each printing session to ensure your supplies will be ready to go next time. Check out those impressions…. looooove!!! 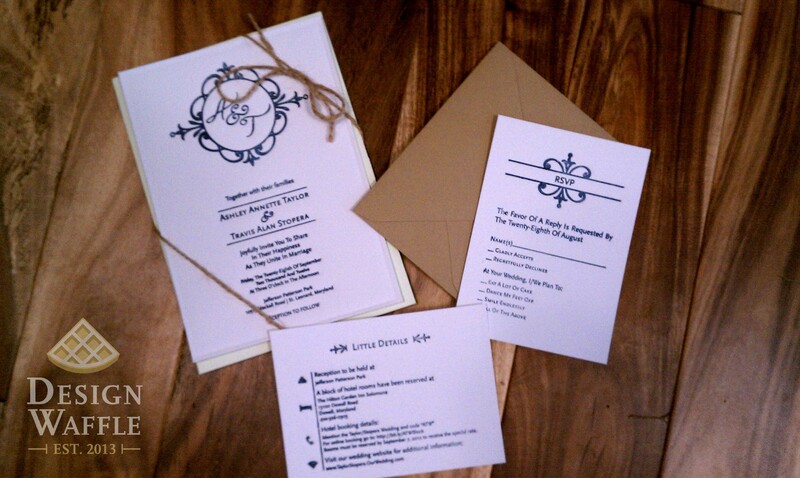 So now you know you don’t have to pay thousands of dollars for beautiful letterpressed wedding invitations. It’s a lot of work, but in my opinion, it was worth every second. We spent around $300 for all of our invitation and save-the-date supplies. That’s pretty tough to beat. I hope you find the guts to give this a try for your own wedding or special event. 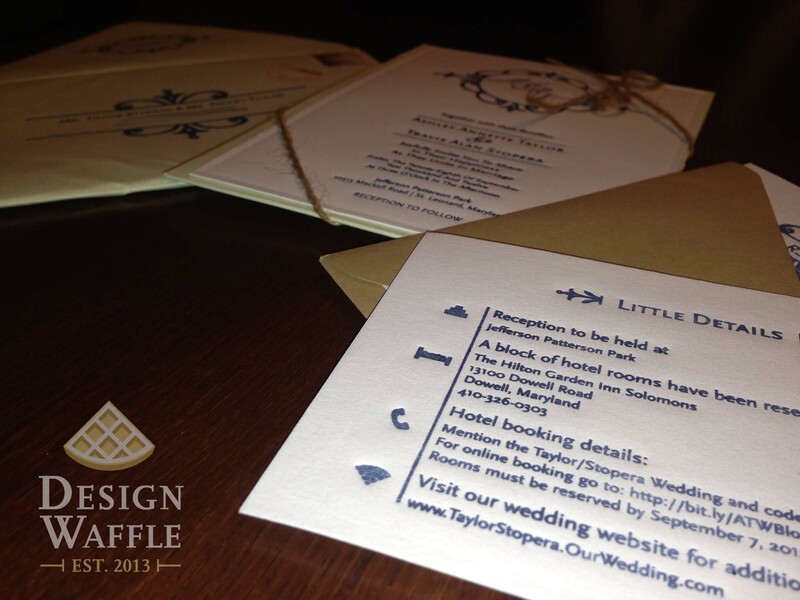 This entry was posted in Graphic Design, Wedding and tagged Design Waffle, DIY invitations, letterpress, letterpressed invitations, wedding, wedding invitations, wedding rsvp. Bookmark the permalink. Where did you get your blank coasters from? I bought the coasters from an etsy shop, but I’m not sure if that specific seller is still offering them. There were many sellers to choose from so it shouldn’t be hard to find them. You could look on ebay too. Hello! 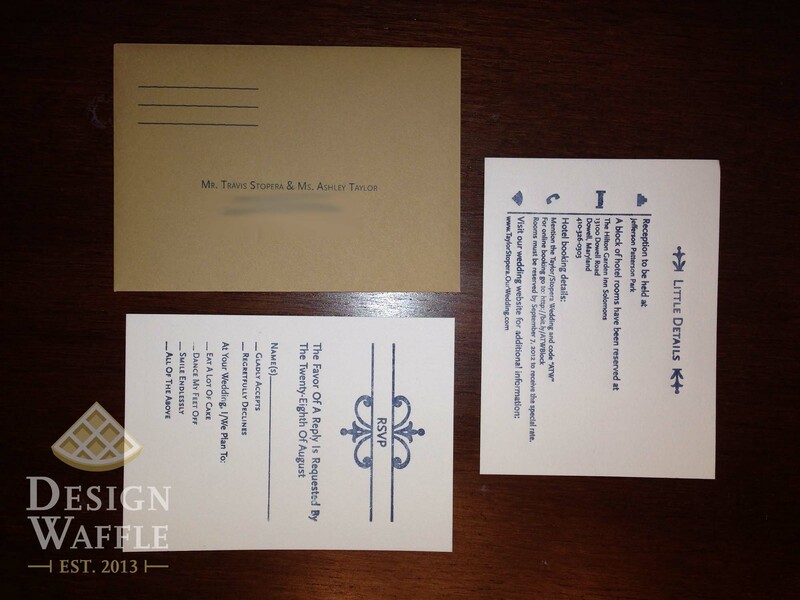 Did you design your own template and then have the letterpress plate made? If not, where did you get your letterpress ready design? I designed my plates with Adobe Illustrator. Then I sent the files to Elum Designs and they made the plates for me.